I'll take the top, right rectangle to block. I haven't seen Toy Story 3 yet, but I don't have to: I've lived it. Yes, in 3D! Creative Communications student Jennifer Hanson recently gave Toy Story 3 a rave review on her two-for-one blog and Independent Professional Project and posted a picture of her favorite childhood toy. She challenged everyone with a blog to do the same. This is mine. Warning: this is about as geeky as it gets. No, really. In 1978, I'd seen Star Wars, oh, about 15 times in the theatre, because there was no bit torrents, iTunes, Blockbuster, or home video of any kind. You had to soak up a movie while you could, because once it left the theatre, you couldn't see it again until broadcast TV bought the rights and showed it with commercials 10 years later. This meant that when an event movie came along, like Jaws and Star Wars, you went back over and over and over until you could recite the lines along with the actors. Luke: "Bigs, Wedge: let's close it up. We're going in, we're going in full throttle, that oughtta keep those fighters off our backs." Wedge: "Right with you, boss." Biggs: "But Luke, at that speed will you be able to pull out in time?" Luke: "It'll be just like Beggar's Canyon back home!" This was also before the obligatory merchandising tie-ins with toy manufacturers and McDonald's, which presented an interesting problem: Star Wars was a surprise hit, and the first action figures wouldn't be ready until a year after the movie came out. Since we all know the rule of supply and demand, we know that the delay meant pent-up demand. So when the figures actually showed up on the scene, insane kids waited for hours and hours and hours, pushing and shoving their way into the stores, yanking Star Wars merchandise from the cold, dead hands of other kids. I got to the store late the first time, only to find empty cardboard boxes with Star Wars logos on them, where the figures had been. I took the empty boxes home with me as a sad consolation prize. Eventually, supply met demand, and my friends and I all had the first wave of figures...except for a little, red rat with a bucktooth. Hasbro made the mistake of thinking that kids only wanted the main Star Wars characters, so it flooded the market with Han, Chewie, and R2-D2, but held back on a little-known or seen character from the Cantina scene, which was awkwardly called, "Snaggletooth." For every kid in town, "Snaggletooth" became the holy grail of toys. We waited next to our landlines - because there weren't cell phones either - for news from the front lines, ready to mobilize mom at a moment's notice. Months went by, and the damn things still weren't in stores. Then, after seeing Star Wars yet again at Grant Park Mall - where it played for years! - my friends and I found evidence: a Snaggletooth cardboard back at Kmart, sans figure! It was like finding a Yeti footprint without finding the Yeti. My friends and I took turns holding the cardboard, staring at it, and blinking. What...the...hell!? I tracked down a store employee and asked, "Are there more of these?" "No, and I'm afraid that this one left the store in someone's pocket. You can have the cardboard if you want." Cue long shot of planet Earth: Nooooooooooooooooo! For the next year, my friends and I lived at Kmart, getting to know clerks on a first-name basis - one of whom eventually called me to let me know that...they had ONE. Mom raced me to Kmart - it was actually there! - I brought it to the checkout in my trembling hands, bought it, took the figure out of the package, and carried it around with me wherever I went, the better to make sure I still had it. But I couldn't tell my friends right away, because I knew how heartbroken they'd be. I felt vaguely selfish, like a goal hanger at the World Cup. So, it wasn't until a few months later that I found myself waiting for the Grant Park bus with my friends, Jason and Kevin, gathered up my courage, and produced the figure to show them. "I found it," I said. "So did we!" they said, and produced their figures, which they also had on their person. That afternoon, Jason, Kevin, and I went to see Star Wars with our three Snaggletooths - Snaggleteeth? - knowing that life would never get better. Until 1980 when that first wave of Empire Strikes Back figures hit Toys R Us...but that's another Toy Story. This is an awesome story! It kind of reminds me of when I was 8 or 9, and really into collecting Beanie Babies. I really wanted Erin - this green Irish bear, but it was pretty rare, and expensive ($70, a fortune for a little squirt!). I'd go to the Children's Museum gift shop and look longingly at it, and I did eventually get it for Christmas...I think it was my parents who bought it for me. Looking longingly at the toy you can't afford - so painful, eh? I recall doing the same with an Evel Knievel figure - I was so entranced, I lost track of my parents and started crying. I was 30 at the time! Wah, wah, wah. Apparently you should have been hanging out at Sears. Well...err...I have that one too. 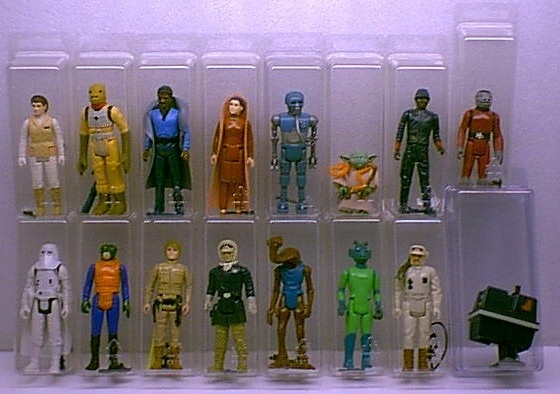 I bought it at age 35 to "complete my set." Don't ask how much. This post reminds me of my twelve-inch, "Six-Million Dollar Man" Steve Austin. Ok. That sounded weird. Gotta go.